Nguyen Thi Duong Ha holds a self-portrait by her husband Cu Huy Ha Vu in May 2013 shortly before he began his hunger strike. Vietnamese authorities will allow imprisoned prominent dissident Cu Huy Ha Vu, who is on the 19th day of his hunger strike, to see his wife to discuss an appeal, she said Friday. The meeting will be Nguyen Thi Duong Ha’s first with her husband since the first week of his hunger strike when she reported he was already in frail condition. Vu, 56, a legal scholar and blogger, has been fasting since May 27 in protest against mistreatment at the No. 5 Prison in Thanh Hoa province that he says has harmed his health and worsened his heart condition. Vu is among dozens of and dissidents who have been thrown in jail since the one-party communist state stepped up a crackdown three years ago. On Thursday, police in Hanoi held another prominent blogger, Pham Viet Dao, on “anti-state” activity charges similar to Vu’s. At noon on Friday, prison officials gave Duong Ha, who is also Vu’s defense lawyer, the paperwork allowing her to meet with him on Saturday to discuss appealing his seven-year jail sentence, she told RFA’s Vietnamese Service. Duong Ha said that since she would be meeting with him as his legal representative, she was worried that she may not be allowed to discuss his health. “Tomorrow when I’m allowed to come in and talk to him, I will be seeing him in the capacity of a lawyer and to do a lawyer’s job,” she told RFA from her home in Hanoi. “I don’t know if I’ll be allowed to ask him how his health is doing after he’s been on hunger strike for such a long time. I really don’t know what will happen tomorrow,” she said. Vu, who has chronic heart trouble and high blood pressure, has spent the past two and a half years in prison for “conducting anti-state propaganda” through his online articles critical of Vietnam’s authoritarian government. He began the hunger strike after prison officials failed to respond to his complaints about detention conditions that he had first raised last year, in particular abuses by one of his guards, according to Duong Ha. After her last visit with Vu on June 1, she described him as very weak. Several prominent activists in the U.S. and Vietnam have staged their own hunger strikes in solidarity with Vu. A prominent legal expert and dissident who had twice tried to sue Vietnamese Prime Minister Nguyen Tan Dung for abuse of power, Vu was arrested in 2010 over articles calling for a multiparty state. He was convicted under Article 88 of the penal code, a provision rights groups say Hanoi routinely uses to silence dissent. More than 40 Vietnamese netizens and activists have been jailed amid a crackdown on online dissent that has intensified over the past three years, with many of them convicted under vaguely worded national security provisions, according to rights groups. 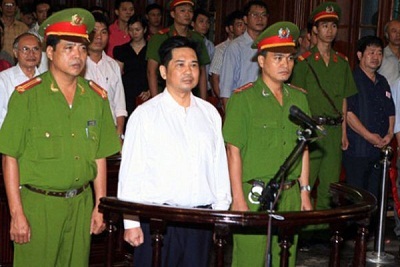 Writer Pham Viet Dao became the latest blogger held for “anti-state” activity on Thursday when he was arrested in Hanoi. Police took Dao, a former government official and member of the Vietnam Writers Association, into custody at his home in the city and searched his house, state media reported. Dao, 61, is accused of “abusing democratic freedoms to encroach upon the interests of the state,” in posts critical of the government, state media reported. If convicted, he faces up to seven years in jail under Article 258 of the Penal Code. A former official at the Ministry of Culture and longstanding member of the ruling Vietnamese Communist Party, Dao has become a well-known Internet commentator, and his blog attracts thousands of hits. His website, which often contains posts critical of Vietnam’s leaders and one-party system, was not accessible Friday, apparently blocked by the government. Dao’s arrest comes weeks after 49-year-old blogger and ex-state newspaper journalist Truong Duy Nhat was detained on May 26 on the same charges.